If you cannot find the Activation window or if you closed the application after installing it, run Kaspersky Anti-Virus 2018 and click the link Enter activation code in the lower-right part of the main window. If you have Kaspersky Internet Security 2018 installed, you can still activate a trial version of Kaspersky Anti-Virus 2018. If you would like to continue using the product after the trial license expires, buy a commercial license. 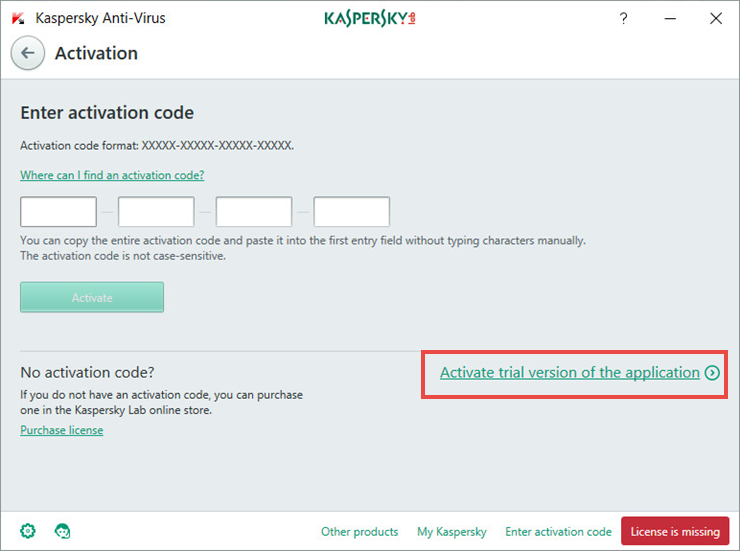 If you cannot find the Activation window, run Kaspersky Anti-Virus 2018 and click the link Enter activation code in the lower-right part of the main window. Each copy of a multiple-device license for Kaspersky Anti-Virus 2018 (for example, a 3 PCs license) is installed and activated in the same way on all computers you want to protect. To activate Kaspersky Internet Security 2018 on all computers, use one and the same activation code you purchased.